Emotional abuse causes you to lose your confidence and lowers your self-esteem. Maybe you have a friend who doesn't seem like she's treated fairly by her boyfriend. Or maybe you're in a relationship that makes you feel kind of crummy yourself -- but aren't sure whether it counts as abuse since your partner doesn't hit you. 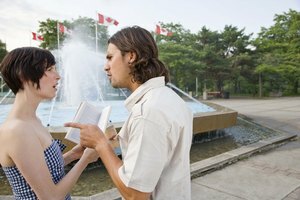 It's important to know that a relationship can be abusive without physical violence, says LoveIsRespect.org, an organization devoted to educating teens and young adults about healthy relationships. While certain relationships may not cause physical harm, they can cause emotional suffering and pain that are just as serious. "Aggressing," which can include behaviors such as calling names, making accusations, pointing blame or using threats, is a major red flag of emotional abuse, according to the Counseling Center at the University of Illinois at Urbana-Champaign. Such verbal aggression indicates that the person is setting himself up as being "above" the other, which negates the equality which is essential to a healthy partnership. The abuser may also claim to be helping by offering criticism and advice about how his partner should act, speak or dress. However, this is often an attempt to put the other person down, which can also create a controlling atmosphere. Another sign of emotional abuse is "denying," notes the Counseling Center. Denying occurs when the abuser refuses to recognize or validate his partner's feelings and experiences. For example, he might put her down in front of a group of friends, but when confronted say, "I didn't say that," or "You're crazy -- that never happened" or "You are remembering wrong." Withholding is another form of denying: The abuser may refuse to listen or talk to his partner, or he might give his partner the silent treatment as a punishment for perceived wrongs. Minimizing is yet another indicator of emotional abuse, says the Counseling Center. This happens when the abuser questions his partner's emotional reactions. For example, he might ignore her all day, but when confronted, say things like: "You take yourself too seriously," or "You make a big deal out of every little thing." The message sent by the abuser is clear: The recipient's feelings and perceptions are "off" and can't be trusted. Minimizing can be especially detrimental because it lowers the abused person's self-esteem and can lead her to wrongly question and mistrust herself, making her wonder if her perceptions and feelings really are out-of-sync with reality. Once someone has been in an emotionally abusive relationship, her perceptions of what is actually healthy may become distorted, making it difficult to recognize emotional abuse when it occurs. Everyone deserves certain things in a relationship, notes the Counseling Center, citing the book "The Verbally Abusive Relationship: How to Recognize It and How to Respond," by Patricia Evans. According to Evans, a healthy relationship is one where both partners support each other emotionally, listen respectfully, treat each other kindly, acknowledge that the other may have a different viewpoint and refrain from cruel language and actions. Also, no one in a healthy relationship should have to worry about being threatened or spoken of with disrespect. Those in emotionally abusive relationships should break it off as soon as possible, urges LoveIsRespect.org, pointing out that breaking up by email, text message or phone may be the safest way to avoid an escalation of dangerous behavior. If you feel you must end the relationship in person, it's best to do so in a public area with trusted friends or family members nearby to discourage your ex-partner from engaging in damaging behaviors toward you. Afterward, it's important to lean on family and friends for moral support and to avoid isolated areas to help protect yourself from potential repercussions. Remember that you have the right to be treated kindly and that no one should live in fear of setting off their partner. LoveIsRespect.org: Should We Break Up? University of Illinois at Urbana-Champaign Counseling Center: Should We Break Up? Budzienski, Jaime. "What Are the Top Signs That Someone Is in an Emotionally Abusive Relationship?" Synonym, https://classroom.synonym.com/top-signs-someone-emotionally-abusive-relationship-9366.html. Accessed 23 April 2019.